The sighting of a pregnant manta ray off the Cocos Island in Costa Rica in the eastern Pacific Ocean is making waves among marine scientists. 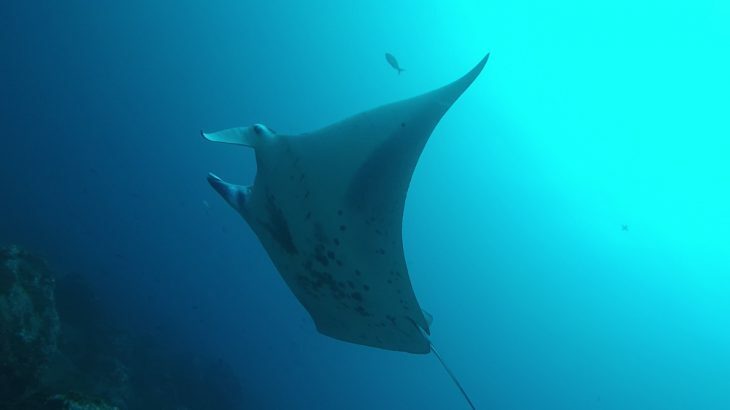 It’s the first time that a manta ray has been spotted so far away from the coastal waters it usually inhabits, and researchers from Fins Attached Marine Research and Conservation say that the female traveled further than any other known reef manta ray. Cocos Island is located around 300 miles from any suitable habitat for the species, and the ray was spotted 3,000 miles away from the nearest confirmed manta ray sighting, according to research published in the journal Marine Biodiversity Records. How the manta ray ended up near Cocos is uncertain, but it’s possible that stress or some other factor forced the manta away from familiar territory and the animal swam in a straight line into the open ocean. Typically reef manta rays stay near coastal reefs, and female mantas give birth to just one pup every two to five years. Researchers have yet to witness a live manta ray birth in the wild. Manta rays can grow up to 16 feet and this particularly manta ray is about 11 feet long. An acoustic tag has been attached to the manta ray to help keep track of its movements.